Making this pita bread recipe is simple but it requires patience and a little practise as rolling out dough and placing it in the pan becomes an art. I find it interesting to watch the pita bread blow up like a balloon only to sink again a few minutes later. This flatbread recipe is common in Middle Eastern countries , Mediterranean countries and the Balkan countries. It is similar to the naan bread which is popular in the Asian south, west and centre. 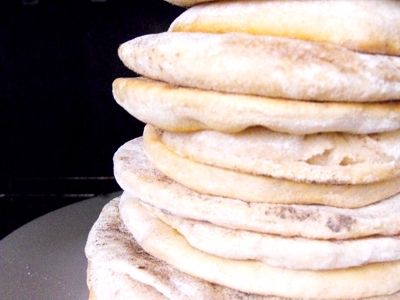 Leftover pita bread is easily frozen with sheets of baking paper in between to stop them from sticking to each other. The flatbreads reheat easily either in the oven or in the toaster depending on size. and go great as an after school snack or for in your school lunch box. The amount makes about 9 pita breads (always depends a bit on size and thickness). Mix the water yeast and honey to set aside for 20 minutes or until the mix gets throffy. After that add the flour and oil form a consistent dough with help of knife or spatula. Then set the dough covered aside in a warm place. Let rise for another 30 minutes or until the dough doubled its size. Dust your hands and board with some flour. Knead the dough, if it is to sticky sprinkle some flour over it. Thereafter form about nine portions. Heat your pan at medium heat. Test with a drop of water, when it sizzles the pan should be at the right temperature. Roll each portion with a rolling stick on a lightly flour dusted board out in a circular shape and put one after another into the hot pan. Check, when the pita bread is light golden turn to the other side. Are the breads thinner they work fine to use as wraps. When they are a bit thicker you can cut them open and fill them. Skip to give feedback to the pita bread recipe. When the dough stick to your hands, dust your hands, working board, and rolling stick with flour.